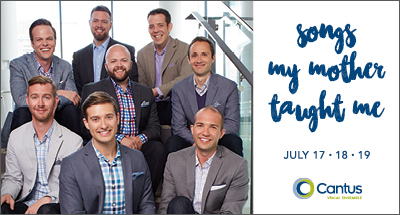 Last July, the Star Tribune called Cantus’ inaugural chamber series “totally successful.” Join us again for an intimate chamber music experience in Songs My Mother Taught Me. Inspired by Dvořák’s composition of the same name and anchored with the timeless cycle of folk songs set by Aaron Copland, Old American Songs, the program couples each singer’s unique individual sound and virtuosity with Cantus’ usual ensemble fare. Thursday, July 19, 2018, 7:00pm – SOLD OUT!